Iowa City Catholic Grade School, formerly Saint Patrick's Parochial School, on the right. Slide printed August 1972. 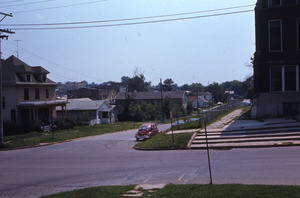 “Court and Linn Streets during Urban Renewal, 1972,” Iowa City Public Library, accessed April 26, 2019, http://history.icpl.org/items/show/851.